The 12nm NTZ was introduced in 2012 to protect both the spawning aggregations of many fish species and the foraging areas of marine predators such as gentoo penguins, cormorants, petrels and prions. Recent tracking data has shown that foraging distances from land of gentoo penguins may exceed 12nm (22.2km) in winter. Increasing the NTZ from 12nm, to 30km will reduce the likelihood of spatial overlap between gentoo penguins and the winter krill fishery reducing the risk of direct competition for krill resources. The move to 30km is consistent with the voluntary measures introduced by the Association of Responsible Krill harvesting companies (ARK) around the Antarctic Peninsula. The existing 12nm NTZs around Shag Rocks and Clerke Rocks will remain the same at 2,337km2 and 1,923 km2respectively. The total no-take zone at South Georgia alone will exceed 22,700 km2, an area greater than the size of Wales. Establishment of a No-Take Zone and a pelagic closed area in zones extending 50km from the South Sandwich Islands resulting in areas of 28,054 km2 and 23,755 km2 respectively. Under the current MPA measures all commercial fishing activity is prohibited within 3nm (5.5km) of the South Sandwich Islands in order to protect the inshore foraging grounds of marine predators and the spawning grounds of fish. In addition, the pelagic ecosystem around the islands is protected from any commercial pelagic (midwater) fishing activity (i.e. krill fishing) to a distance of 12nm (22.2km). The enhanced measures will greatly increase both the size of the total NTZ and the pelagic closed area by prohibiting all commercial fishing activity within 50km of the SSI except for a small, highly regulated amount of fishing for toothfish which will be strictly limited to depths between 700m and 2,250m (see map). This activity will continue to provide data that is essential for regional toothfish stock assessments. Commercial pelagic fishing in the waters overlying this area will be prohibited. The area closed to krill fishing and all pelagic commercial fishing in the immediate vicinity of the South Sandwich Islands will exceed 51,000 km2, over 50% of which will be a total no–take zone. This precautionary measure will mitigate competition between the large krill-dependent penguin populations of the South Sandwich Islands and future krill fishing activity (noting there has been no krill fishing at the South Sandwich Islands since 1992). A NTZ covering 62,900km2which prohibits all fishing activity in the vicinity of the South Sandwich trench will protect this globally significant and unique habitat. It is the deepest part of the Southern Ocean (>8000m) and the only such feature south of the Polar Front. As such it is likely to contain unique habitats that are currently poorly studied and mapped. Protecting the trench area would provide a pristine environment for scientific research and education. The no-take zone stretches 50km either side of the mid-point of the trench covering depths from 3000m – > 8000m from 55oS. 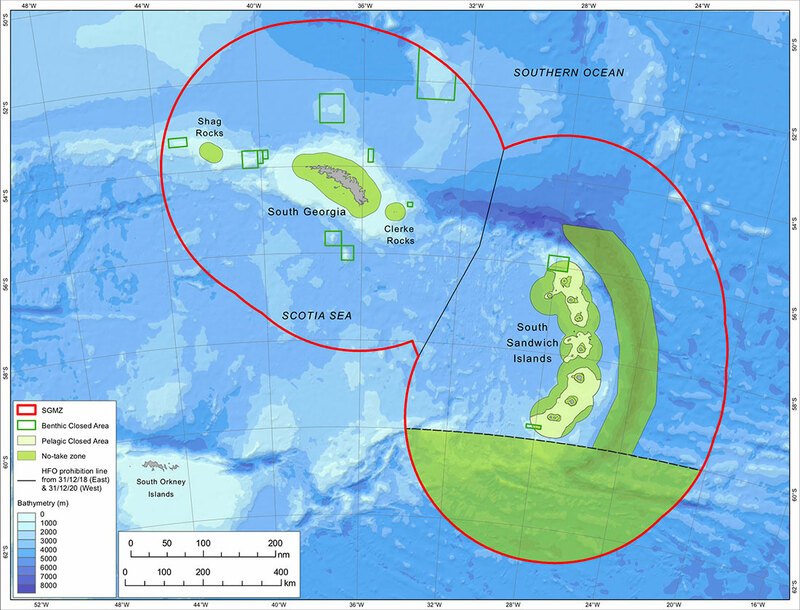 The GSGSSI will formally designate the region of its Maritime Zone located south of 60o South as a full NTZ within the MPA which will be closed to all commercial fishing activity. This region contains complex bathymetry and habitats including seamounts, deep trenches and a large area of the South Sandwich Fracture Zone – a region of high hydrothermal and tectonic activity. The seafloor invertebrate communities are poorly described but thought to be diverse, including many species of deep-water coral. The region is an important area of biological connectivity between the South Sandwich Islands and the islands and seamounts of the Southern Scotia Arc. It lies within the seasonal pack-ice zone an area completely covered by sea ice in winter. The area protected exceeds 170,000 km2. In order to reduce competition for resources between the fishery for Antarctic krill and krill-dependent predators such as penguins, fur seals and flying seabirds, the fishery is currently closed in the summer months (November-March). This closure prevents overlap between the fishery and predators during the key part of their breeding season when their foraging ranges are restricted. New data on seasonal predator distribution and a potential for an increase in the numbers of many seabird species following the successful eradication of rodents at South Georgia suggests that extending the seasonal closure would further reduce the risk of overlap. Therefore, as a precautionary measure the seasonal closure of the krill fishery will be extended by two months. The fishery will now be restricted to the winter period from May to September. In addition, the fishery is restricted to those areas outside the NTZ and the pelagic closed areas. For seven months of the year commercial krill fishing will be prohibited across all 1.24million km2of the MPA. To protect the environment from any mining or hydrocarbon activity into the future, legislation will be enacted to completely prohibit all commercial minerals exploitation. No such activity has ever been conducted in the Territory, and doing so without a permit from the Commissioner would be an offence. However, whilst it is long-standing policy that the Commissioner would not permit the commercial exploitation of minerals, this is currently not covered by specific SGSSI law. Enacting legislation will align SGSSI with the position in Antarctica where extraction, other than for scientific research, is prohibited under Article 7 of the Protocol on Environmental Protection to the Antarctic Treaty. To enhance protection for unique terrestrial and marine ecosystems, the use and carriage of heavy fuel oil (HFO) by any vessel undertaking activities in the South Sandwich Islands will be prohibited by 31 December 2018. GSGSSI will import the definition of HFO used in international law which prohibits the use and carriage of heavy fuel oil in Antarctic waters. GSGSSI will extend the prohibition across the SGSSI MZ no later than 31 December 2020.